I don't need to dress up much on the daily. In fact, I've developed quite the love affair with the politely termed "athleisure." But, on the weekends, when I'm with my husband, I like to take an extra step towards dressing up. The littlest change can make a difference. Not only with my style, but with my mood too. Love this! That duster is fabulous! You look amazing! 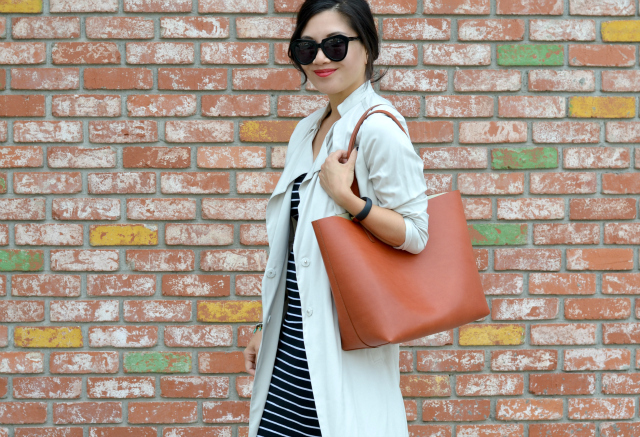 I love the long trench and striped dress! I love your outfit. You look so chic and classy. Love the easy layers of this outfit! Yes it's amazing how the simple act of dressing up can actually affect our mood. Looking fab! Chicest mama on the planet! You look great! I've been working from home a lot these days, and it makes it a little tough to get dressed. I almost feel like I don't want to "waste" a good outfit...but getting dressed nicely makes me FEEL better, so it's probably not a waste! Anyhow, I'm really loving this look and having some serious shoe love! Love your dress!! You looks so gorgeous!! Such a classic outfit and love how the lace-up heels add a touch of edgy vibe to the overall look! I like your dress a lot. I agree its nice to make a bit of an effort with dressing up. You feel great when you think that you look nice too. You are looking so stunning Nancy. Motherhood agrees with you. 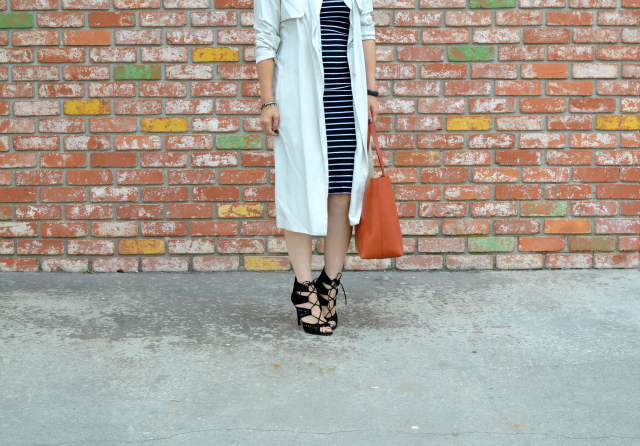 I love striped dresses and I am wearing one on the blog today, also layered. I love your trench and lace-up stilettos, pretty lady. Gorgeous! I just love stripes :) This dress is great because you can dress it up like you did here with heels, or pair it with flats or even sneakers for a more casual look. That trench is such a great touch! Love the stripes! 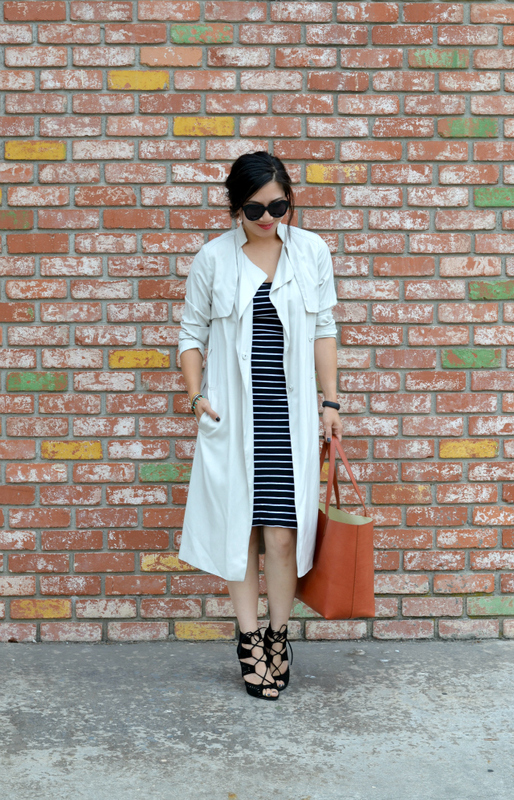 The trench is so classic and on trend. Lovely look. You look so fabulous! 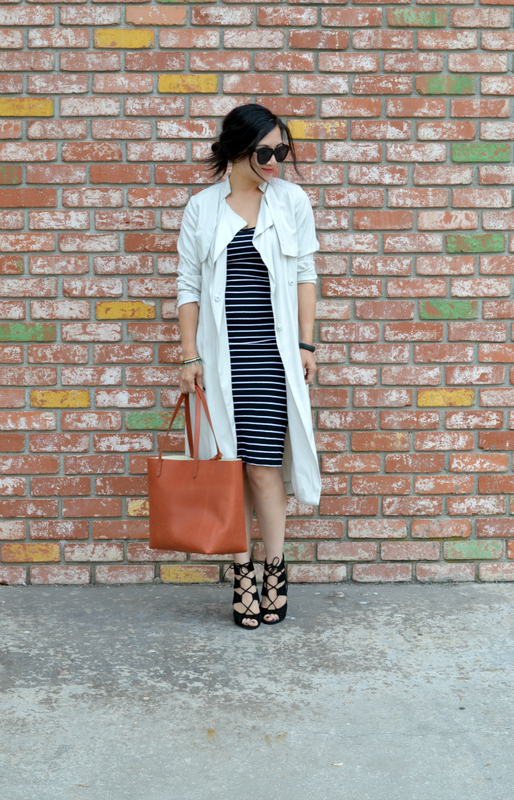 In love with the stripes with the long white trench! 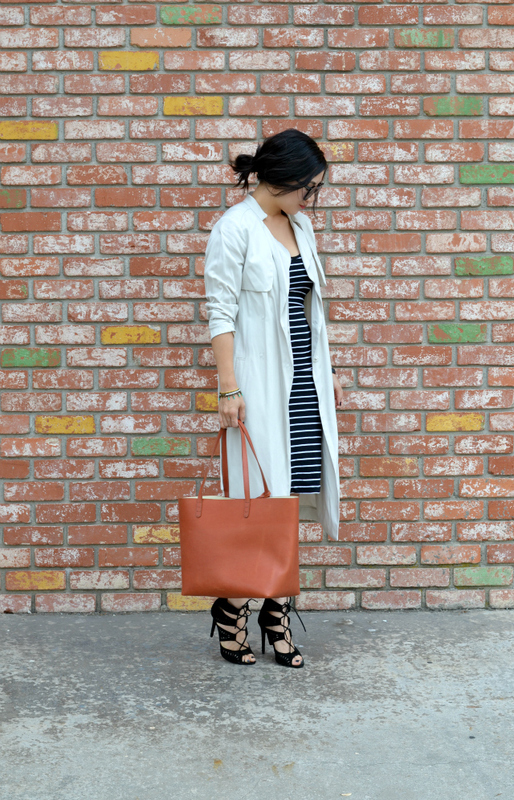 I'm loving that trench! It's gorgeous with your striped dress! Looking great! And I totally agree. I had two jobs where I worked from home (in the past and now) and I used to skip the step of actually getting ready and stayed in my PJs all day but then I switched it up and got ready even though I'd be home all day. Made such a difference to how I felt and after realizing this I always made sure I looked put together!